BB? Must be a bluesbreaker pedal clone. Maybe a JTM45 in a box? Xotic doesn’t clearly say anywhere what the inspiration for this pedal came from. I’ve owned the pedal for years and I still couldn’t tell you exactly what it’s supposed to be, but I can tell you with confidence this pedal is GREAT! 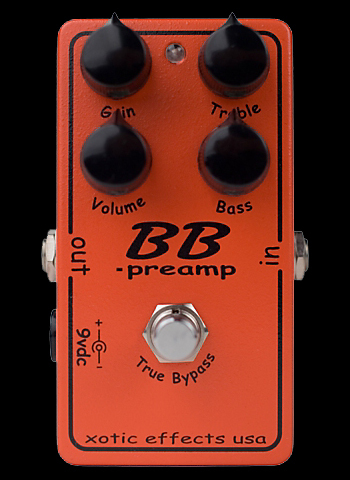 The BB Preamp by Xotic is a swiss army knife of an overdrive pedal. Calling it an overdrive almost feels unjustified. It’s more of a dynamic, multifaceted tone shaper disguised as a compact overdrive. The circuitry, from what I understand, stems from the TS family. Tonally, it ends up being much more scooped in the midrange. There’s a 2 band Bass and Treble EQ that allows you to choose exactly where you want the pedal to sit in the mix. It does just fine as a clean boost. Transparent and clear. I hear so much natural tone out of the guitar in this setting that I could probably tell you how much the guitar weighs. The gain at 9 o’clock hits the front of the amp just right. Nice and gritty with evident clean in tact. That’s where I like this pedal best. I’ll leave it on all night like that. Just enough to color the amp a slightly different shade of what it already was. Despite what I said earlier about not being entirely sure if it was a Super Lead and a Basketweave that inspired this pedal, the BB does a pretty great Band of Gypies or Houses of the Holy in a package much smaller (and more affordable!). So if you can’t crank the good ole’ 100watter and lug out the 4×12, consider this pedal not as the best emulator of british amps, but the most versatile and applicable that I’ve found. True bypass and built like a tank. Xotic is the definition of quality. A great company to work with as well. I’m a huge fan of just about everything they produce. Whatever style you play, whatever tone you’re chasing, trust the BB Preamp by Xotic Effects to help you get there.